We take waste management and the environment very seriously and do our best to minimise waste by specifying equipment fit for purpose, providing the longest term investment strategy so that whatever WEEE we create as part of our trade is minimised as much as possible and only after the equipment we supply and support has had the greatest amount of life it can give taken. When equipment comes to the end of its useful life we assist our customers with finding suitable recycling partners who give the equipment a second chance life before being sent for recycling. At Surftec we handle repairs and displaced broken components are sent to recycling where plastics and metals are recovered and reused. We have encouraged our suppliers to recycle and actively separate and deliver reusable materials to recycling companies locally. We when possible move redundant but serviceable (must not be classed as waste, but equipment with value) equipment typically to new school owners who can make use of it. For example used by perfectly acceptable computer equipment from business customers to education customers. 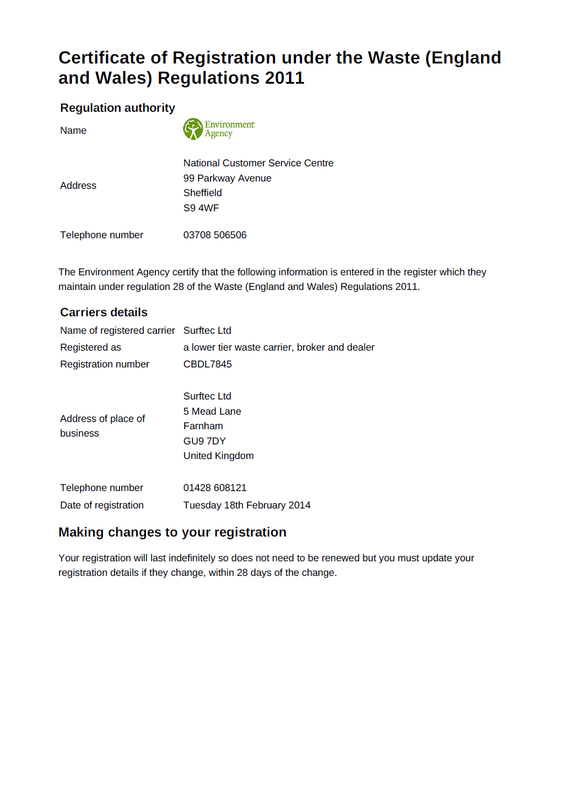 As part of central governments efforts to maintain high levels of standard we are registered with the Environment Agency under the Lower Tier scheme. Lower Tier registration allows us to transport machines both working and beyond economical repair as long as the owner of the equipment does not class it as waste. Often schools ask for failed systems back so their own in-house IT staff can recover parts, it is at this point not waste. If this is a schools intended purpose for the broken system we can return it and transport it as part of our Lower Tier licence. If the machine is waste and a school simply intends to place it in their own bin we cannot take it off our premises and has to be disposed of within our property and removed by a licensed waste handler. Our lower tier licence does not allow us to transport waste. We can store the waste at our premises for up to one year under the “Waste Exemptions NWFD2: Temporary Storage at the place of production”. Making one or more broken systems into a good system? When a system comes to us for repair it is expected the majority of the time we can repair it. However at the point a customer deems a system beyond economical repair and no longer has any use for the system it becomes waste. It is at the point it is decided the system is “Waste at the place of Production” and we are limited on how long we can store it for. This makes it difficult for us to recover parts from one or more systems to make one or more good systems unless a customer specifically says the system is not waste and they intend for it to be used in that way.